While I love Havanese a lot myself, I still think there are some goods and bads about Havanese that a potential future Havanese owner should know before he or she gets one. When we look at Havanese, it’s easy to be attracted by their cheerful character, cute face, big eyes and the beautiful hair. However, owning a Havanese is a long term commitment. Remember, from the moment you take your Havanese home, you are his or her everything. That’s why we should look past the obvious good things and make a more rational decision. It’s the same thing that we don’t want to marry someone only because of his or her attractive appearance. Owning a Havanese is a similar long term commitment to getting married indeed. Now, let’s dive into some of the goods and bads about Havanese. I will actually start with the bads because too many people are familiar with the goods. There is two sides to a coin. Havanese have a very cheerful personality, and at the same time, they don’t like being alone. I am not saying that if you have a 9 to 5 job, you can’t own a Havanese. That’s not practical advice. I mean, who don’t have to work a 9 to 5 job in a capitalist society. May be if we are living in a world 300 hundred years ago, we can farm and have our Havanese running around us at the same time. In today’s world, it is not uncommon that a pet owner has to leave their pets alone for 8 plus hours. That part we can’t really control. But the remaining the 16 hours are time that we can control. So the fact that Havanese hates being alone means that you should give up some of your fun activities and be with them more. Stop thinking about going out every night after work. It is more responsible to go home right after work. If you used to go out five nights every week, make it two. If you can’t do it, may be Havanese isn’t for you. Usually, small dogs don’t have too much joint issues due to their light weight. However, Havanese’s inherit bone structure make them the exception. They do have a high tendency of having joint problems, especially if you don’t take care of them well. The part that you have to pay much attention to is to keep your Havanese in a healthy range of weight. That means that you have to put effort into their exercise and diet. For example, you should walk at least 30 minutes with your Havanese. You should spend some effort into your Havanese’s diet and home-cook for him or her if you can. These things are very easy to do for a lot of people if I am only asking them to do it for weeks. But to do it for something like fifteen years, everyday, it can be a little difficult for some people. It’s okay to know that you don’t have the quality for being a good Havanese owner. Everyone is different afterall. It’s like you don’t expect Michael Jordan to be a good singer (May be he is, I am just making this up to illustrate my point). You definitely won’t blame him for that. If you can’t be a good Havanese owner, just don’t get one. It is a tragedy if you understand yourself throughly and make the wrong decision, ending up wanting to give up your Havanese weeks after you own it. Havanese are famous for their super cheerful character. They are almost always happy for some reasons. It’s just a wonderful feeling when you come home from a tough work day and see your Havanese cheerfully greeting you home. Many people struggle to find their meaning of life. I would say that the ultimate goal is to have a happy life, this is a combination of having a career that you love and having meaning relationships. Your Havanese can almost certainly help you take care of your latter part. One huge advantage of choosing a Havanese over other breeds is that the Havanese are very good with kids. In other words, they generally are very friendly to kids. Kids usually also love Havanese in return. Some dogs are just a little too strong or aggressive to have around your kids and Havanese is not one of them. Havanese are generally intelligent enough to be trained as watchdogs. With reasonable efforts, you should be able to home train your Havanese to learn some simple tricks like “hand”, “come” and “sit”. 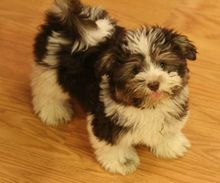 Havanese is one the cutest breed given their big eyes, lovely face and beautiful hair. Some dogs look cute only when they are puppies. Havanese still look cute when they are adults. Although you should never being dog owners because you think some dogs are cute, the lovely look of Havanese is definitely a very big advantage over other many other breeds. I hope that the above goods and bads about Havanese can help you look more clearly on whether you should become a Havanese owner. Don’t avoid the reality. See things the way they are and you will usually make better decisions.